Will you buy acai and pomegranate, or will you buy VITALITY? And it’s true. People buy stuff that makes them feel better, seem more clever, look more attractive and come across as more generous. The post on Buffer shows some excellent examples, with one of the most well-known being Steve Jobs’ “1,000 songs in your pocket” vs “1GB storage on your MP3 player”. Nice. 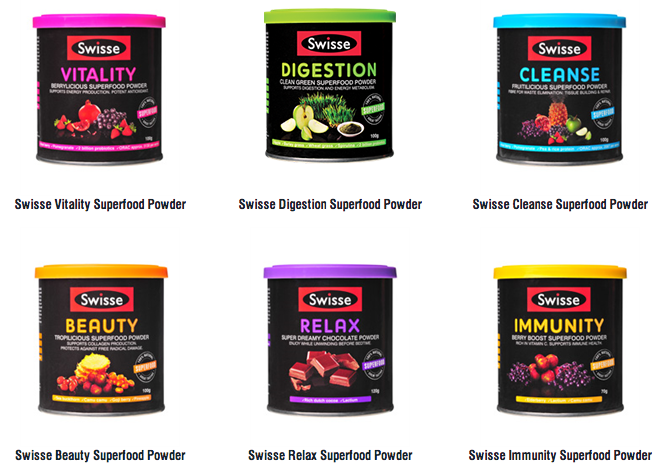 An example of this that I’ve noticed recently is Swisse’s ‘Superfood Powder’ range that came out about six months ago. The products are called: Vitality, Digestion, Cleanse, Beauty, Relax and Immunity. In contrast to the neighbouring products on the supermarket shelves, a busy consumer who wants to be a better / more beautiful / cleaner / more energetic human will quickly see that (through clever naming and design) this line stands out because it immediately promotes the benefits, not the features. Aside from raising questions as to how a product that lists cane sugar and fructose as two key ingredients can be also marketed as a “Superfood”, the fact remains that to a consumer, a product labelled ‘Relax’ is inherently more enticing than a product that is named after its key ingredients. Similarly, ‘the benefit’ is why Evernote isn’t just an app that stores things that you might forget. It’s a way to Remember Everything. It’s also why Campaign Monitor isn’t just an online tool that allows people to manage subscription databases and distribute e-communications to their client base. It’s a service for businesses to Send beautiful email newsletters. What’s the last product or service you purchased? Do you remember why it spoke to you? Listen to your consumers, present them with benefits, and make sure your product is great enough to keep its promise.